Through the Change Our World program, we focus on positively impacting the most vulnerable people in the world by empowering the organizations that support them. My team has the pleasure of interacting daily with dynamic customers that come from all walks of life (and industries). The common thread amongst these organizations is a strong set of values that are honored with each decision the company makes. For example, some companies especially value customer service, while others stress company culture. What we have found in those that stand out from the pack is a great emphasis on making Corporate Social Responsibility (CSR) and philanthropy central to the company. At Qlik, we don’t engage in CSR for company needs like giving back to environment because your business takes from the environment in some way. We do it as a way of corporate engagement. We believe our Qlik software can change the world. So how does Qlik play a role in all of this? First, we practice what we preach. Corporate Social Responsibility and philanthropy are both pillars of Qlik culture – for both our team members, like-minded partners, and the company as a whole. Five years ago this month, we launched our Change Our World global CSR program. Through the Change Our World program, we focus on positively impacting the most vulnerable people in the world by empowering the organizations that support them. 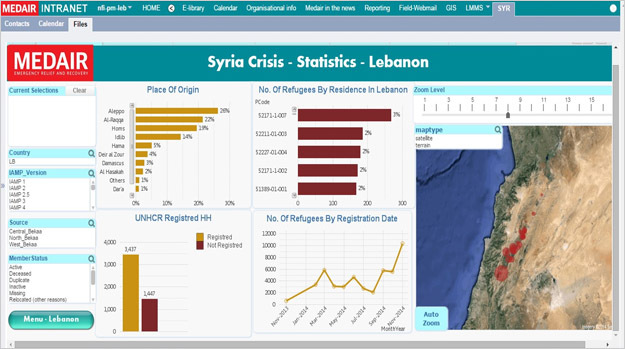 We donate resources needed to help humanitarian and community-focused non-profits gain visibility into data sources that can accelerate outcomes, connect donors with recipients, and make their great work even better. Happy 5th Anniversary to #Qlik's 'Change Our World' global #CSR program! Consider this example from one of two official Corporate Charity Partners, Medair, which provides relief to the most vulnerable people of the world who have been most impacted by natural and man-made disasters. By providing Medair with Qlik technology and support, Medair has been able to bring shelter and supplies to refugees in Lebanon, displaced by the conflict in Syria. And that’s not all. In 2014, Qlik team members and Medair not only joined forces to travel to Haiti to help the people devastated by earthquakes and hurricanes, but we also hosted a Hackathon at our partner conference, Qonnections. The Hackathon was focused on helping Medair’s fundraising efforts by challenging teams to use Qlik Sense and its open APIs and web integration capabilities to develop an impactful application for the organization. In just one day, participants leveraged Twitter data and Medair’s internal information on budget, expenditures, fundraising, and beneficiary data on the types of emergencies Medair responds to and how many people they have helped around the world to build an application. As a result, Medair “can now calculate the amount of money it would take to reach all the beneficiaries in a certain crisis in the world with just the slide of a mouse,” says Wendy Dyment, MD, MPH, Senior Health and Nutrition Advisor for Medair. Technology and the power of information can make a huge difference when it is accessible – easy to get up and running and actually fun (and addictive) to use. Take any complex problem or challenge, whether it be healthcare reform or a retail supply chain or adoption in Brazil (as demonstrated in Qlik’s Open Data Challenge), and we all need a way to sort through the clutter and gain insight. The change is we don’t always need data specialists in their lab coats sifting through mountains of data. But don’t just take our word for it. Stay tuned to the blog to hear more about our CSR program, and the wonderful work our grant recipients and charities are doing. The more you hear about it, the more you will feel like we do – that the power of what we do is not about the data, it’s what data does for people.